The atmosphere of Jakarta Pavilion at Jakarta Fair, Kemayoran, Central Jakarta this year looks different. This time the pavilion, located in Hall C1 provides children's playground.
" We're deliberately preparing a game of creativity to stimulate the child's motor"
Based on Beritajakarta.id, various games provided by Jakarta Library and Archives Dept., ranging from puzzles, Lego, swings, and slides are crowded played by children. 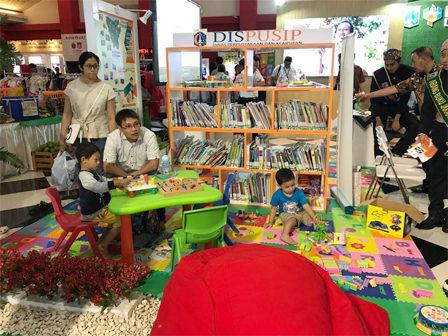 "We're deliberately preparing a game of creativity to stimulate the child's motor," expressed Wahyu Haryadi, Head of Jakarta Library and Archives Dept., Thursday (5/24). He explained, various facilities are provided to bring the library closer to the public. The provision of playground facilities in Jakarta Fair is also in accordance with the direction of Jakarta Governor, Anies Baswedan. "So all this is to introduce the progress of the work program that we do," he told. Aside that, his side also provides various kinds of books that can be borrowed directly from Jakarta Fair visitors. "We also provide digital books and e-archives that can be accessed here," he stated.